In human sexuality, kinkiness is any unconventional sexual practices, concepts or fantasies. The term derives from the idea of a “bend” (cf. a “kink”) in one’s sexual behavior to contrast such behavior with “straight” or “vanilla” sexual mores and proclivities. The term kink has been claimed by some who practice sexual fetishism as a term or synonym for their practices, indicating a range of sexual and sexualistic practices from playful to sexual objectification and certain paraphilias. Kink sexual practices go beyond what are considered conventional sexual practices as a means of heightening the intimacy between sexual partners. Some draw a distinction between kink and fetishism, defining the former as enhancing partner intimacy, and the latter as replacing it. Because of its relation to “normal” sexual boundaries, which themselves vary by time and place, the definition of what is and is not kink varies widely as well. Why does Operation Hammond provide services to the Kink and Fetish community? 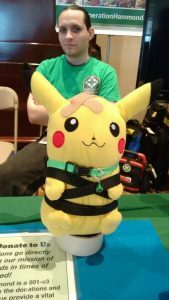 The kink and fetish community has unique and sometimes complicated needs in regards to safety and basic first aid care. There are not many organizations providing safety and basic frontline first aid care to this community. Is Operation Hammond a non-profit organization? Yes, we operate under the name of Operation Hammond First Response, Inc. We are incorporated as a non-profit in the state of Massachusetts and are a registered 501c3 non-profit with the IRS (EIN: 45-5007706). Are members of Operation Hammond paid for their time or services? How much does Operation Hammond charge for its services? Operation Hammond strives to keep its services affordable to all conventions and events that request them whenever possible. We are very flexible when it comes to payment and fees for our services. For more information about our funding and payment model please visit our Funding model page. Please visit our main FAQ section at this link.